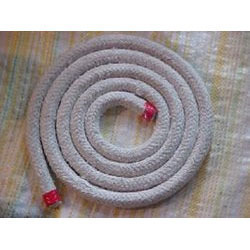 Pioneers in the industry, we offer Rope Packing Products such as Asbestos Fiber Rope, Ceramic Fiber Rope Packing and Fiberglass Rope Packing from India. Asbestos Fiber Rope are widely used in the heavy machinery industry in the processes of heat insulation of pipes and boiler sealing, hot blast valves, blue cap doors. Packaging Details: ¿¿¿¿¿¿¿ 8.0 mm to 25 mm ¿¿¿¿¿¿¿¿ 5 or 7.5kg, ¿¿¿¿¿¿¿ 32 to 50 mm -10, 20 or 25 kg. Our company specializes in offering qualitative range of Asbestos Gland Packing Rope. The particular properties of asbestos which enable its fibres to be used in textiles are : length, strength, toughness, purity and flexibility. These fibres are subjected to exacting treatment of opening, cleaning and blending, and processed through carding, spinning and other stages. A small percentage of high wet modulus organic fibres are incorporated with asbestos fibre to facilitate the processing. 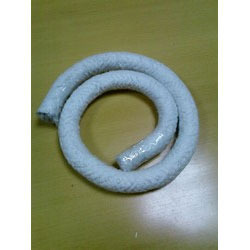 The Ceramic Fiber Rope Packing is reinforced with fiberglass filament, and optional alloy steel wire. Ceramic fiber textiles (cloth, tape and rope) contain a certain amount of binder material which is normally burned at lower temperature and does not affect the insulation property. Fiberglass Rope Packing is braided by texturized glass fiber yarn, used as a gasket seals for high temperature. It is the excellent substitute for asbestos packing. 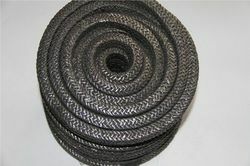 They are widely used as gasket for industrial ovens and furnaces, boilers and wood burning stoves. 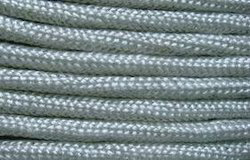 Fiberglass braided rope are asbestos free, cause no harm to health, making them ideal replacements to asbestos ones.